This year we met at the Church Hall of the Catholic Church, the Sacred Heart in Bushey High Street. It was cold and dark outside and we had the American Election results on our mind. However the church hall was laid out beautifully and as is usual over a hundred people arrived warm and generous in spirit. 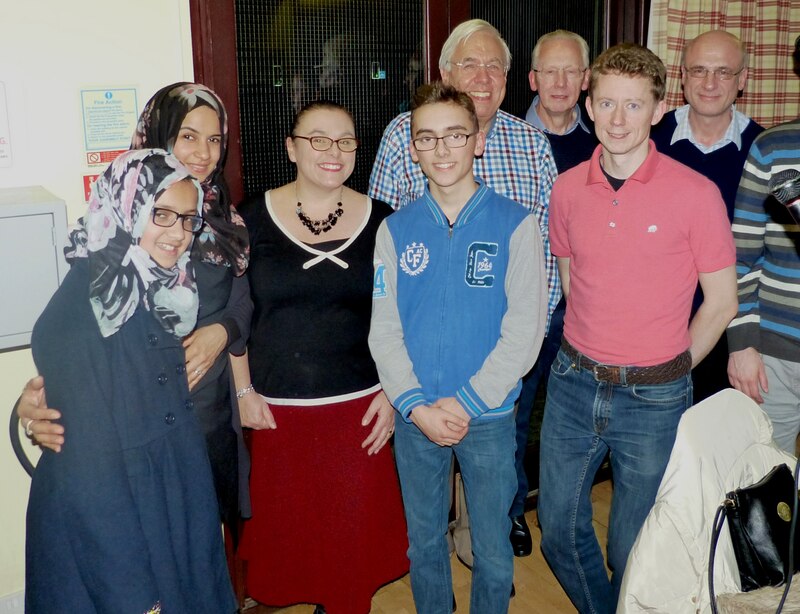 We were going to discuss “Faith and the Family” and we had two generations within each of four families representing the Jewish, Catholic, Anglican and Muslim faiths. Each family spoke for about fifteen minutes split between the fathers and mothers and the sons and daughters. We heard from Mary Anne and Euan Petrie first, congregants at Sacred Heart. Mary Anne was brought up in the orthodox way and felt her religion was duty led. She teaches RE at a Catholic School. Her son Euan, who attends the school, is more relaxed although the family pray together at home each day. As opposed to his mum who confesses monthly fourteen year old Euan does this twice a year. Next up were Martin and Alex Benedyk from our Bushey shul. Martin explained about his upbringing, as a three times a year Jew, and then when he was seventeen he became more interested and observant. He and his wife have four sons, all of whom have babysat for our grandchildren. Alex is one of their orthodox sons and he spoke about his ambition to teach and how the humanities failed society and so he hopes religion may be the salvation of humanity. It was very deep; he is a highly intelligent young man, whose views we were privileged to hear. We then heard from our committee member, Makbul Rahmin’s, daughter and granddaughter Sakina and Fatema Zahra Chandoo. They are members of Stanmore Mosque. 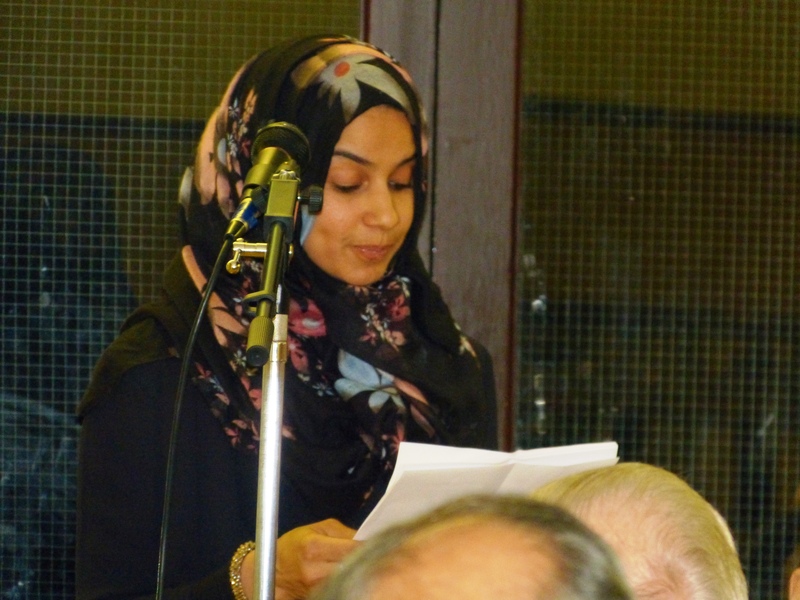 Sakina described a familiar scenario to the Jewish audience, growing up in the UK as a member minority faith and being so thankful that she and her family could practice Islam in peace and without hindrance. Her twelve year old, very articulate daughter described her life as the only Muslim who wanted to wear a Hijab at her school, North London Collegiate, no less. She enjoyed explaining her faith to the other pupils and her teacher. They were both a great credit to Makbul. Finally were heard from Tony Quinn and his son Jonathan. Tony told of his upbringing on a Belfast farm and then life in Cairo and Istanbul. Whilst in Cairo he was able to take a trip to the Holy Land and visit the Christian sites. He was very surprised, probably thinking it was going to be like Northern Ireland (or perhaps like Blake’s “Jerusalem”), when he discovered the reality which is the dusty, exciting chaos, the Israel we love and know! He finally settled in Bushey when Jonathan was at University in London. Jonathan found Christian life in London distracting with so many more interesting and exciting things to do on a Sunday than go to church. All of us can identify with that sentiment! 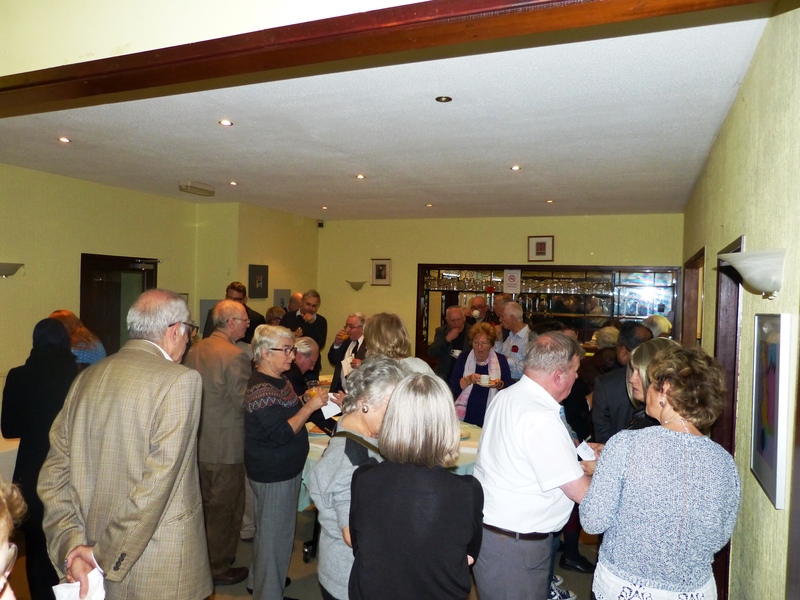 We then broke for generous and delicious refreshments provided by our hosts and it gave us an opportunity to chat with our speakers and members of the other faiths. The evening concluded after a reluctant return to our seats with a Q&A session and a vote of thanks. A leaving collect raised around £200 for the New Hope Trust for the homeless in Watford.